This vessel is a sleek 57' sailing catamaran that will carry you at a high speed driven by the tradewinds and the sails themselves. 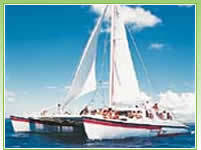 The point of this trip is to relax, put your feet up after a crazy morning or a late arrival into Nassau, and just "feel the wind". Bring swimsuit, beach towel and sunblock. 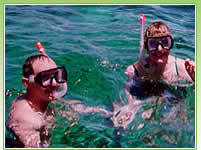 Snorkel equipment,lunch and complimentary soft drinks and rum punches are included. This tour starts at the Paradise Island Ferry Terminal. Meeting instructions will be included in your voucher. All prices include service fee.